Since the beginning of time man has had a need to pick stuff up. Food, water, firewood, building materials – all of the necessities of life need handling, raising, and lowering. And whether it was motivation to achieve greater feats of lifting than our bodies could accomplish on their own, or just a lazy desire to avoid hard work, mankind quickly looked to design tools to raise our lifting game. But long before he and others tried to work out the math behind why a lever allowed us to multiply our lifting force, everyday folks were utilizing a pole and fulcrum to get stuff done. 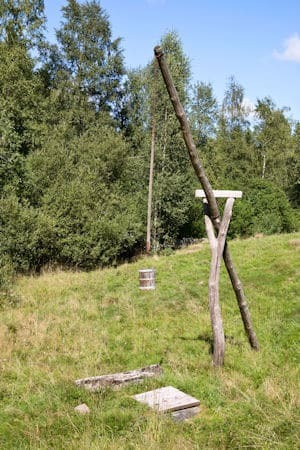 The ancient Egyptians are credited with creating a Shaduf – a mounted pole and counterweight system used to take most of the effort out of hauling water up out of a well. They didn’t need to understand the scientific principals behind the mechanical advantage provided by the lever to benefit from it, any more than a kindergarten student needs to know the force times distance formulas to have fun on a seesaw. And happily that fine tradition of benefiting from a tool without completely understanding it carries on to us. And not just for complex tools like laptops, cell phones, and internal combustion engines – it also holds true for lifting tools built around the principles old Archimedes studied, like the lever hoist. Thankfully the instruction manuals for the tools we use in our workshop don’t require us to be conversant in joules, foot-pounds, or newton-meters. All we have to do to suspend the hoist, attach the hook, and pull the lever to take our place among the long line of humans that use tools to cheat gravity.